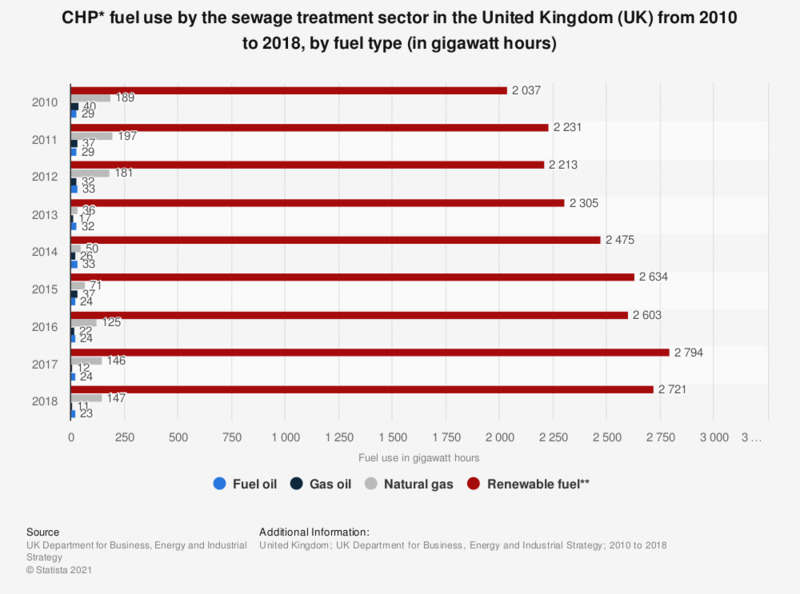 This statistic displays the Combined Heat and Power (CHP) fuel use by the sewage treatment sector in the United Kingdom (UK) from 2010 to 2017, by fuel type, in gigawatt hours. It shows that the CHP use of renewable fuels in the sewage treatment sector increased significantly over this period from 2,037 gigawatt hours in 2010 to 2,726 gigawatt hours in 2017. The use of natural gas decreased notably in 2013 to 36 gigawatt hours but increased again and reached 140 gigawatt hours in 2017. **Renewable fuels include: Biomass; sewage gas, other biogases, municipal solid waste and refuse derived fuels. Data for 2010 was taken from a previous report.